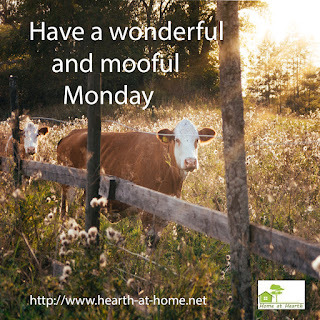 Hey, Have a wonderful and mooful Monday. Today I'm deciding to have a wonderful Monday. Cows moo for lots of reasons. They communicate with one another, looking for a friend, exploring a new territory, when horsing around, calling their calf, hungry, want milked and lots of other reasons.Once in awhile they get mad. Today I could moo madly because Photobucket hijacked 1000's of my photos I stored from over several years. I'm choosing to overcome! You'll notice on the website I removed the header temporarily since Photobucket, without warning put a huge banner in place of mine saying I needed to buy a plan to host my images on a 3rd party site. And I can't get my photos back without paying $400. I'll replace the header soon and am working on my sites to restore what's messed up as well as all over the web. What are you overcoming today?? P.S. I will be shariing those luscious 'watermelon soaps' soon!